On this page you can post messages. Before your message here, we must first approve. We strive to within 24 hours to publish a notice. Velden met een * zijn verplicht. Je email-adres wordt niet gepubliceerd. We reserve the right to edit messages or not to publish all. De Artemis is een authentiek dwarsgetuigde driemaster met uitstekende zeileigenschappen. Dit jaar heeft het schip een afwisselend en uitdagend vaarprogramma. Aan boord werk je samen met een vaste crew van zes personen. Binnen ons bedrijf Tallship Company kun je je verder ontwikkelen in het vak. Wij bieden een goede arbeidsovereenkomst, salariëring en pensioenopbouw. De vacature is voor het gehele seizoen, maar als je een deel ervan beschikbaar bent, komen we ook graag met jou in contact. Vera Hemmen en ik, Gizelle Mijnlieff gaan het project van ons dromen realiseren, namelijk een documentaire maken op de Bark Europa, een dwars getuigde driemaster. Nu hebben wij een crowdfundingsactie gaande die nog veel boost kan gebruiken, en hebben wij daar jullie hulp voor nodig! For the clipper Friendship we seek skipper and size for season 2019. To prepare the Friendship for the season we are looking for March / April people who want to perform maintenance. As you no doubt have noticed, For example, while taking exams to EZS, we use former students regularly during surveillance and taking the examinations made (and retakes) in the gymnasium of the EZS. We do this so that we notice that our, directors and teachers, takes care of a huge amount of work. In recent years we have worked with a small team of motivated volunteers, and we now find that we really need to strengthen. Do you have time during the test days this year and do you like to help us at a small (trip) compensation? Sea Cloud and Sea Cloud II deckhand and deckcadet opportunity. Sea Cloud is a 4 masted barque built in 1931. She has a traditional rig and is one of the largest squareriggers in the world. LOA 110m, 2523 GT, sail area 3160 m2. She is fully certified under SOLAS as a passenger ship. She sails as a luxury cruise ship with 64 passengers and 60 crew under Malta flag. Sea Cloud II is a 3 masted barque built in 2003. She also has a traditional rig and is even a bit larger. LOA 117m, 3849 GT, sail area 3000 m2. She is also fully certified under SOLAS as a passenger ship. She sails as a luxury cruise ship with 96 passengers and 65 crew under Malta flag. I have sailed there for three contracts and found it a very pleasant environment with great sailing and destinations in Europe,,en,the Atlantic Islands and the Caribbean,,en,But it requires a lot of hard work and discipline,,en,Sea time is fully credited as they are merchant vessels,,en,Right now deckhands and deck-cadets are needed,,en,Contracts are usually for,,en,months,,en,renewable,,en,The crewing managers are in London and very professional,,en,You need the Basic Safety course as well as the medical certificate and a seaman's book,,en,Crowd and crisis course can be done onboard,,en,Previous experience on a square rigger or sailing ship is a plus,,en,You will receive a monthly salary during the contract period and air tickets,,en,Language on board is English,,en,You have to be able and willing to climb the rig,,en,If you are interested,,en, the Atlantic Islands and the Caribbean. But it requires a lot of hard work and discipline. Sea time is fully credited as they are merchant vessels. Right now deckhands and deck-cadets are needed. Contracts are usually for 4-6 months, renewable. The crewing managers are in London and very professional. You need the Basic Safety course as well as the medical certificate and a seaman's book. Crowd and crisis course can be done onboard. Previous experience on a square rigger or sailing ship is a plus. You will receive a monthly salary during the contract period and air tickets. Language on board is English. You have to be able and willing to climb the rig. If you are interested, please contact me via email,,en,Jörg Peter Berendsen,,nl,jp@berendsen.aero,,en,Rob van Kasteel,,nl,Visit the website of Rob van Kasteel,,en,www.yachtcouple.com,,en,from Alkmaar,,en,Dear employers,,nl,I am looking for a few weeks / months of work for my STCW vbb master,,nl,chief mate all ships and master all sailing ships are valid,,nl,I am also a master certificate mega yachts,,nl,yachtmaster offshore,,en,large sailing certificate all inland waters,,nl,rhine patent,,nl,radar vessel inland shipping,,nl,Nautop I t/m III enz enz,,en,Documents,,nl,I will be happy to send you certificates and references on request,,nl,Current vbb is completely up to date and valid until September,,nl,I can immediately be used worldwide for coastal shipping,,nl,great trade,,nl,superjachten,,id,towage,,af,government etc as long as the ship is sailing under STCW,,nl. Ik zoek enkele weken/maanden werk om mijn STCW vbb master <3000GT, chief mate all ships en master all sailing ships geldig te houden. Tevens ben ik ibv master certificate mega yachts, yachtmaster offshore, groot vaarbewijs alle binnenwateren, rijnpatent, radarpatent binnenvaart, Nautop I t/m III enz enz. Documenten, certificaten en referenties stuur ik u op verzoek graag toe. Huidige vbb is geheel up to date en geldig tot september 2020. Ik ben direct werelwijd inzetbaar voor kustvaart, grote handelsvaart, superjachten, sleepvaart, overheid enz zolang het schip maar onder STCW vaart. De Koninklijke Watersportvereniging Loosdrecht zoekt een havenmeester. Je kunt nog tot 27 June 2018 reageren. We are looking for the season 2018 nog een matroos. Ons vaargebied is de Oostzee en de Noordzee. Our sailing area is the Baltic Sea and the North Sea. De J.R. Tolkien momentum both week tours and day trips, which we are also at most major Sail events. The J.R. Tolkien does both week trips as day trips,,en,we are also present at the most large Sail events,,en,Hamburg Port Days,,nl,Sail Greenwich London,,en,en Sunderland River Wear,,en,UK,,en,The Tall Ships Race also starts in Sunderland,,nl,from J.R,,fr,Tolkien also participates,,nl,The race goes from Sunderland to Esbjerg,,nl,and from Esbjerg to Tananger,,no,A wonderful event where such a,,nl,Tall Ships to participate,,nl,The events where we are this year at least are,,en,Hamburg harbor birthdays,,de,United Kingdom London,,en,Greenwich Sail,,en,and Sunderland,,en,River Wear,,en,In Sunderland is the start of the Tall Ships Race where J.R,,en,Tolkien is one of the ships in the race,,en,It will go from Sunderland to Esbjerg,,en,Denmark,,en,and from there to Tananger,,en,Norway,,en,A beautiful event with,,en,Tall Ships in the race,,en,Also have a look at our website,,nl,Please also see our website,,en,Do you like sports,,en, we are also present at the most large Sail events. In Sunderland begint ook de Tall Ships Race, de J.R. Tolkien doet hier ook aan mee. (Norway) Een prachtig evenement waar zo’n 50 Tall Ships aan meedoen. Hamburg Hafengeburtstage, Kieler Woche, Hanse Sail Rostock, United Kingdom London (Greenwich Sail) and Sunderland (River Wear ). In Sunderland is the start of the Tall Ships Race where J.R. Tolkien is one of the ships in the race. It will go from Sunderland to Esbjerg (Denmark) and from there to Tananger (Norway). A beautiful event with 50 Tall Ships in the race. Are you into sports? We have a Wakeboard on board and a fast boat. Wij bieden goede arbeidsvoorwaarden en een goed salaris. We offer good working conditions and a good sailors salary. You have minimum rating rating,,nl,You have certification Rating Deck,,en,Information,,nl,Captain,,en,www.seastewardship.com,,en (beslist een must) en belangstelling. You have certification Rating Deck (definitely a must) and interest. One double cabin available for paying crew,,en,Departure 29th April,,en,With our,,en,modest non-profit organization,,en,we assist Pacific islanders to deal with the consequences of climate change,,en,the destruction of their low lying island home,,en,Within the next generation,,en,the lowest lying islands will be uninhabitable and many people will have to be relocated,,en,Local island communities,,en,churches and private,,en,asked us to help them prepare for the inevitable transition,,en,Providing economic opportunities is our major goal,,en,The culture of the Kiribati people is seriously Endangered because of rising sea levels,,en,Their identity,,en,lifestyle and history must not go extinct,,en,This is why we are documenting their unique language,,en,songs,,en,tales and the ancient lore of Pacific navigation,,en,During this trip one of the last 'Tia Borau,,en,master navigator,,en. Departure 29th April. With our modest non-profit organization we assist Pacific islanders to deal with the consequences of climate change: the destruction of their low lying island home. Within the next generation, the lowest lying islands will be uninhabitable and many people will have to be relocated. Local island communities (churches and private) asked us to help them prepare for the inevitable transition. Providing economic opportunities is our major goal. The culture of the Kiribati people is seriously Endangered because of rising sea levels. Their identity, lifestyle and history must not go extinct! This is why we are documenting their unique language, songs, tales and the ancient lore of Pacific navigation. During this trip one of the last 'Tia Borau' (master navigator) has promised us to introduce the crew to the ancient lore of Polynesian navigation,,en,This is the timeline,,en,th March,,en,departure for Maui,,en,th April,,en,provisioning and bunkering in Oahu,,en,departure for Kiribati,,en,th May,,en,arrival Christmas Island,,en,departure for Fanning Island,,en,In the moment we have a competent crew of,,en,female and me myself,,en,If you're interested,,en,Please let us know if you're interested for this voyage,,en,or on the next,,en,leaving from Fiji end of October,,en,Salty greetings,,en,Ben,,zh-CN,Deckhand,,en,Hostess / host wanted,,nl,For the sailing ship Pedro Doncker we are looking for a motivated Deckhand,,nl,Hostess / host,,nl,Pedro Doncker is a barquentine,,nl,meters and speed in East,,nl,and North Sea,,nl,Your future tasks,,nl,Varied work and tasks on deck led by the captain,,nl,Welcome the guests on board and an open ear their wishes,,nl. In the moment we have a competent crew of 3 female and me myself. If you're interested. Please let us know if you're interested for this voyage, or on the next, leaving from Fiji end of October. Voor het zeilschip Pedro Doncker zijn we op zoek naar een gemotiveerde Deckhand & Gastvrouw/ -heer. Pedro Doncker is een barkentijn, 47 meter en vaart in Oost- en Noordzee. Bij interesse of vragen over de voorwaarden, kunt u contact opnemen met Silvia Wartenberg, Tel. : +4917630143034 of per e-mail: info@vscharters.com. ( Norway) Een prachtig evenement waar zo’n 50 Tall Ships aan meedoen. V&S Charter biedt een baan als kapitein, stuurman of maat in een dynamisch zeilteam op het tallship Pedro Doncker (47 meter), from April to mid-October 2018 (or a part of the season). Pedro Doncker sailing day- in weektochten o.a. from Kiel in Germany and is a known member of the sailing events in the North- and Baltic Sea. Met een salarisindicatie van 2800 Euro for the captain position,,nl,Would you like to be part of the Pedro Doncker team and learn about the different positions please contact,,nl,cees Schoonbeek,,nl,from Son,,en. De taken van de kapitein omvatten het leiding geven aan de bemanning en u bent verantwoordelijk voor het reilen en zeilen op het schip in de breedste zin van het woord. Both the maintenance and keeping in seaworthy condition of the vessel, and also good contact with the guests and our office are important. Vaarbevoegdheid master of sailing ships tot 500GT, in the sailing area IIIA. info@vscharters.com of bel Wieke Vlaun: +31651759232 of Silvia Wartenberg: +4917630143034. Many miles, sail as well. Several Atlantic crossings and charter experience. As 1st or 2nd officer. Also a retired medical doc. Call Cornelis (Cees) Schoonbeek. Dutch resident. Wanted: Leuke 'Boots' voor zeiljacht Cherokee. In een super mooi vaargebied: Scotland, Faröer, Orkney en Shetland eilanden, Ierland, Cornwall, Bretagne en de Kanaal eilanden. Van 21 May to 10 October. Gage € 1050,-/maand + 7% vakantiegeld. Zeil je graag en ben je op zoek naar een relaxte leer-werkplek (de vaartijd wordt opgeschreven in je monsterboekje) in een heel mooi en afwisselend vaargebied (elke dag een andere haven) en ben je klantgericht en enthousiast? Class Afloat - operator of the STS Gulden Leeuw, is hiring a 2nd Officer on a 2 month contract beginning January 27, 2018 in Bridgetown, Barbados and disembarking on March 28, 2018 in Havana, Cuba. Shorter contracts disembarking in Costa Rica can be considered. The 2nd Officer must hold a valid STCW-95 certificate with a Dutch certificate of competency for sailing vessels (or equivalent sail endorsed license). and medical with at least 1 year experience as an Officer a comparable vessel. Competitive wage, air travel to and from, and health insurance provided by Class Afloat. 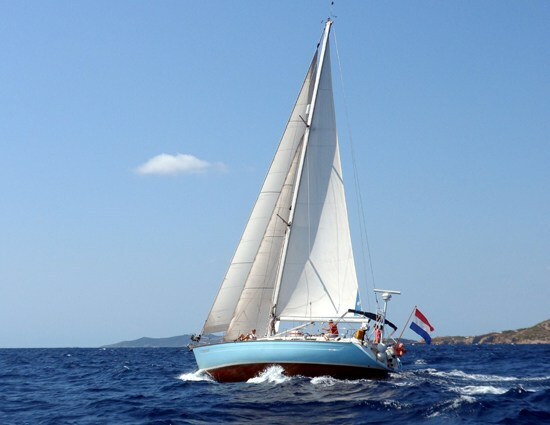 For more information on Class Afloat, the Gulden Leeuw and this year’s itinerary please see www.classafloat.com. Concreet gaan we eilanders opleiden voor het maken van houtsnijwerk. Ik heb contact met resort eigenaren op het hoofdeiland (Christmas Island) die naarstig vragen naar souvenirs voor hun (rijke) visserman toeristen. Vorige reis op deKwai had ik een set carving tools aan een vriend gegeven op Washington island, en bij mijn volgende bezoek overhandigde hij me twee schitterende maskers. De resort eigenaar (op het andere eiland op twee dagen varen) was enthousiast. Dus er is lokaal vraag en aanbod. Het plan is om een tijdje de kiribati eilanden op en neer te varen voor het vergaren van handicrafts. Daarna door naar Fiji voor droogdok en om te bevoorraden en te bunkeren. We zijn op zoek naar enthousiaste zeilende reisgenoten die willen helpen investeren in deze expedite. Wat we te bieden hebben is het avontuur van je leven op onze 70 voets custom built Lidgard. Bovendien kan ik je helpen met je EZS opleiding, en het aftekenen van je EZS boekje. We zijn nog maar net begonnen om eea op poten te zetten, dus als je creatieve ideeen hebt voor crowd funding of het creeeren van een social network, dan hou ik me graag aanbevolen! Met een salarisindicatie van 2800 - 3600 € bruto voor de positie kapitein. De taken van de kapitein omvatten het leiding geven aan de bemanning en u bent verantwoordelijk voor het reilen en zeilen op het schip in de breedste zin van het woord. Both the maintenance and keeping in seaworthy condition of the vessel, and also good contact with the guests and our office are important. Vaarbevoegdheid master of sailing ships tot 500GT, in the sailing area IIIA.